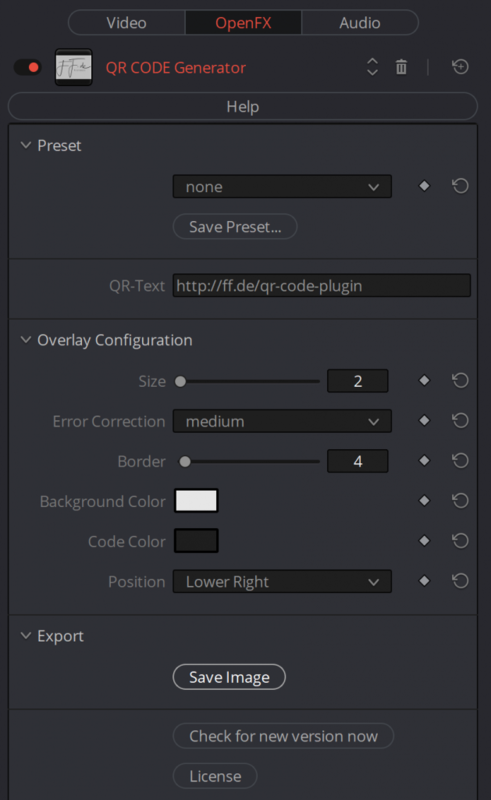 QR Code Generator Plug-in for Davinci Resolve, Adobe Premiere and Adobe After Effects (Windows Versions). With this plugin, you’re able able to insert QR Codes into your video production. This allows viewers to visit a specific website with more information, read an additional text, link to your social media profiles and much more – you name it! QR Code Generator Plug-In in Resolve. In this section, you’re able to save and open presets for this plug-in. You may store all your settings, including text color and position into one preset file. This allows you to maintain the same style across different projects. Here you’re able to enter the text information of the QR Codes itself. This may be plain text or links or other functions. of course, you can do other things as well: Send money to a PayPal or bitcoin address, trigger calender events, link to your Youtube channel, Instagram Profile or put in geolocation. Size: The size of the QR Code is measured in pixels per code element. So size “2” means 2×2 pixels per individual code element. Every size setting is resulting in integer sized square blocks. This is our way to make sure scaling does not affect the readability of the code. Once you pick a size that exceeds the screen dimensions or you hit a border of the video image, the size will be limited to make sure the QR Code is not cropped. Error Correction: Your choice of error correction. Higher error correction means more space occupied by the QR Code, but it also means less risk to reading errors caused by image artifacts while reading the code. Border: A border around the QR code helps to improve readability and also it looks nicer. The border size is measured in pixels and gets restricted if the QR Code hits the border of the video image. Background Color: Here you can define the color of the background (usually white). As much as it makes sense to create nice colors and follow the style or cooperate identity of the video, please keep in mind that maintaining a high level of contrast means better readability of the code. Code Color: That’s the color of choice for the individual code elements. Position: Your choices here are “Upper Left”, “Upper Right”, “Center”, “Lower Left”, “Lower Right” and Manual. When you put it into one of the corners, please use an appropriate border so the code can’t be affected by overscan. Save Image: This button allows you to create an 8-Bit TIFF File of the QR Code itself. The default file name is created using the QR-Text you are using. This option might become handy when you want to use the same QR Code somewhere else. For example on a web page or printed materials like a poster, a cover or similar. Question: Why should I use a QR-Code in my video? Answer: When you produce videos, you never know where they end up to be played. Sometimes your viewers are in a hurry and want to get quick access or take a quick note about what they have seen. If you offer a QR-Code inside the video, it’s easy as opening the camera app on a smartphone, pointing it to the screen and heading to the according website. Educational videos might benefit from additional information that can be kept current, review videos may carry an affiliate link, videos from influencers may point to their profile on instagram or any other sort of social media. Possibilities are endless! Question: Why do I need a QR-Code generator as a plug-in? Answer: Only because it is VERY convenient. We understand that there are other ways of creating QR-Codes outside your video editing or color grading application, but that means you need to save the generated image, import it and place it somewhere. At the same time you need to make sure you’re not importing an QR Code image that does not belong to the video or decrease the readability of the code by scaling it. With our QR Code Generator Plug-In, you not only achieve perfect quality, but also have the fastest solution to embedding QR-Codes in your videos.